Wishing you all the joys of the Holiday Season, and a Happy New Year! Let’s welcome the most celebrated holiday season once again and join in on the festivities at Alila Villas Soori. A range of sparkling feasts and jovial dinners await you on the shores of Kelating, as our seaside dining venue and the sprawling beach lawn host a series of sunset menus and highlights for your family and friends. It is time to pop the champagne as the sun goes down, or enjoy our bespoke programmes that range from premium culinary fare to exploring the resort’s breathtaking setting. Indulge in festive afternoon teas served daily at The Reading Room with an assortment of sweet and savoury as well as excellent tasting plate of premium caviar and sparkling champagne. Celebrate this prelude to the pinnacle of the holiday season at the seaside of Alila with a specially designed 5-course menu paired with wine and Christmas inspired cocktails. Flowing angelic youth voices fill the air with Christmas carols as you enjoy an atmospheric evening with us. Admire various collections of traditional Balinese textiles comprising rare ikat weaves and colourful batiks at The Reading Room and learn about the ancient craft and techniques of Balinese weaving. After you've worked up an appetite opening presents all morning, indulge in our hearty Christmas lunch at Cotta with festive cocktails and wine pairing. The Reading Room, celebrating the joyous season with the little ones during lunch. Put Christmas cheers on your fingertips! Get fun nail art designs and play with lively colours that reflect the joyful spirit of the festive season at our Spa. What can be more exciting for the little ones than having fun and showing their creativity to start the New Year! They can make and decorate bracelets and necklaces with colourful beads at The Reading Room. Something memorable to take home and show off to their friends at school! It’s a unique holiday! Celebrate the joy and share the Christmas gifts with the children. Alila Villas Soori “Gift to Share” programmes have been running to support the students from elementary schools in Kelating, providing educational tools and funds in supporting the development of the extracurricular facilities at two local schools. On Boxing Day you can take part in our Gift to Share initiatives supporting children’s education. Take pleasure in a sunset barbecue on the shore at our Sunset Lawn, with a scrumptious international grill served with special festive cocktail mixes. In support of “Gift to Share” initiative, a percentage of funds raised will be donated to elementary schools in Kelating. Explore the neighbourhood to enrich your cultural experience; visit the Puri Kerambitan, a prominent old royal palace in the Kerambitan district. Here you will learn the history of the Kerambitan area and witness the real daily activities of the Balinese, from the local market scenes, rice paddy fields, to a Balinese house compound and even getting your hands dirty in ceramic making. The little ones can discover the eloquent moves of different forms of traditional Balinese dances. Classes will introduce basic techniques of Balinese dance; steps, arches, ‘lightning’ glances, and striking hand gestures of the Balinese dancer for a few hours of fun! Presenting a showcase of Balinese dances. Terracotta plays an important role for the Balinese. It is used in daily activities as well as religious ceremonies; large pots are traditionally used as water jars but are more commonly used in modern times for decorative purposes. Now it is your time to master the art of making Balinese terracotta. Sound Balancing is an effective and proven modality that uses resonance to help reduce stress, alter consciousness and create a deep sense of peace, wellbeing and better health. Vibration and Sound therapy has been shown to be a vital part of one’s healing process, delivering a type of energy remedy that creates a sacred space in which people can heal from stress disorders, pain, depression, emotional roller coasters and more. Join us in bringing in the New Year on Bali’s serene Southwest coast - Alila Style! We invite you to come together for sunset cocktails and canapés then indulge in a seven-course set menu with wine pairing specially prepared by our resident chef Dwayne Cheer and his team. As the clock turns to the burst of cheers, the seaside of Alila will sparkle up with fireworks and DJ hits the celebration with cool tunes. Join in the Balinese tradition of making Canangsari, a typical Balinese offering to the Gods. “Canang” refers to the tray woven out of young coconut leaves, while “Sari” refers to the essence of the offerings, which may be the vibrant colours of Balinese blossoms, incense stick or even cookies and sweets on top of it. You will be taken around the resort’s shrines to place your own Canang to thank the Gods and see their blessings in the year ahead. The first meal of the year! The New Year’s brunch is a sophisticated plate you can savour at any time of the day. Find a much tastier late morning delight with Bloody Mary and fun twists of festive brunch favourites. Bring in the New Year cheers with a Nusantara style feast Cotta Lawn, as we present an Indonesian barbecue dining experience that features diverse local flavours from the country’s 17,508 islands, namely Sumatra, Java, Sulawesi, Bali and Lombok. Prices are in thousand Rupiah and subject to 21% tax and service charge. Advance reservation is recommended. Apakah anda salah seorang penyuka minuman teh Chatime ? Jika Iya, pasti akan senang dengan informasi berikut dimana Chatime kini menghadirkan berbagai rasa Madu dalam varian rasanya. Di CHATIME, resep minuman diolah menggunakan daun teh pilihan, 100% buah segar asli, dan komposisi pilihan lain, yang kesemuanya didatangkan langsung dari Taiwan. Untuk menjaga kualitas, aroma, dan kesegaran produk kami, teh selalu diolah menggunakan brewing machine setiap 4 jam sekali. Demikian juga untuk topping grass jelly, pearl, dan pudding yang dimasak langsung di toko tanpa menggunakan bahan pengawet. Anda pun bisa memilih sendiri takaran sugar dan ice sesuai dengan selera Anda sehingga menikmati Chatime akan semakin menyenangkan. Madu memiliki banyak manfaat baik bagi tubuh. Selain dapat menjadi pengganti gula untuk pemanis dalam minuman, madu juga bermanfaat untukmengikis lemak tanpa menguras energi. Dengan kita mengonsumsi madu maka energi kita akan meningkat sehingga kita terhindar dari rasa lapar. Madu juga dapat membantu memperbaiki sistem pencernaan. Kini Chatime Honey Series yang terbaru menghadirkan rangkaian New Flavor Honey : Honey Milk Tea, Honey Black Tea, Honey Green Tea, Honey Lemon Aloe. Ke-4 varian rasa ini akan memberikan sensasi baru bagi para penikmat minuman Chatime. Untuk harga, sama seperti Chatime jenis lainnya, berkisar antara Rp. 21.000 – Rp. 24.000. 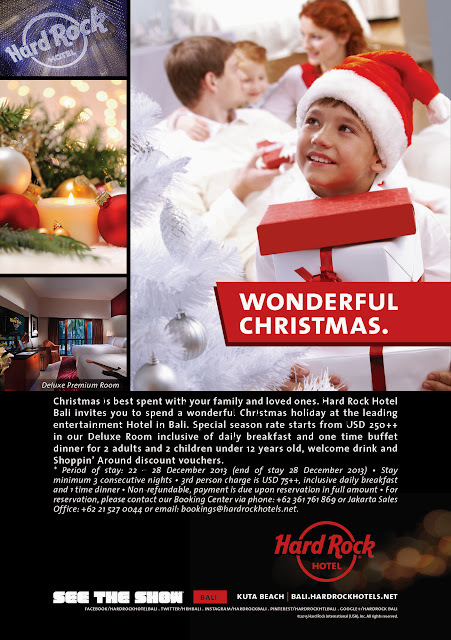 Bali, November 12, 2013 – This year’s festive season, Hard Rock Hotel Bali announces dinner and party events to make Christmas celebration extra wonderful for all the family. For the perfect Christmas Eve on the world’s renowned Kuta Beach, Chef Low Keng Meng has crafted a pre-concert Christmas Buffet Dinner Starz Diner restaurant that offers the traditional dining highlights of the season that includes Honey Glazed Ham, Roast Turkey, Christmas Yule Log Cake and more. All customers can delight in sumptuous culinary offerings and distinctive entertainment at Hard Rock Hotel Bali’s Christmas Eve or Christmas Day buffet dinner at the price of Rp. 250,000++ per adult and Rp 125,000++ per child under 12 years old. 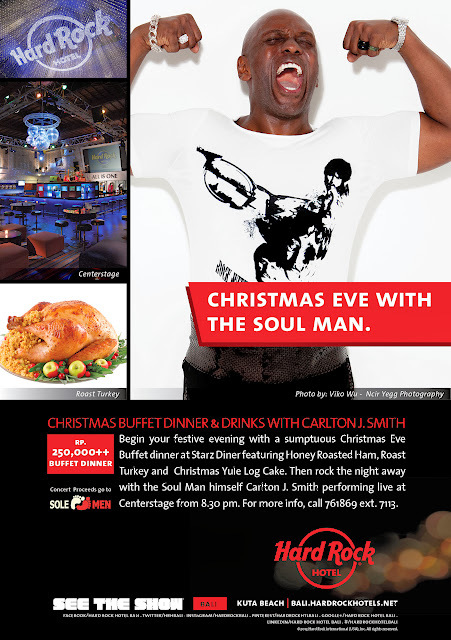 Carlton J. Smith, a renowned soul singer from USA, will be the headline performance for the Christmas Eve Party at Centerstage, Hard Rock Hotel Bali on Tuesday, December 24, 2013. Since 2002 Carlton has produced, hosted and performed in R&B/Soul Revues in New York City’s world-renowned B.B. King Blues Club & Grill. Initially a one-show deal, his first performance sold-out and inspired the club to book him monthly for a series of tributes to stars including Al Green, James Brown, Curtis Mayfield, Sly & The Family Stone, The Temptations, and Marvin Gaye. A Carlton J. Smith concert experience is not to be missed as he elegantly manages the audience with unstoppable energy and shouts out interactions making the audience ask for more every time he performs in different parts of the world. A percentage of the Christmas Eve Concert proceeds will be donated to the Solemen Indonesia Foundation to benefit the underprivileged families in Bali. The Christmas Eve Buffet Dinner and Concert are all inclusive as the part of the Wonderful Christmas room package. Stay for minimum 3 consecutive nights in the Christmas period from 22 – 28 December 2013. The package is offered starts from Rp 1.880.000++ per room per night for Deluxe Room (room rate is valid for Indonesian citizens and KITAS holders). Hard Rock Hotel Bali also promises an unforgettable New Year’s Eve Dinner and Countdown Party with an extensive array of culinary delights. The dinner begins with a tantalizing lobster starter with a glass of premium sparkling wine, continued with a myriad of International food stations from Italian, Chinese to Japanese, from seafood to sashimi as well as a cheese and dessert selection, all served with free flow wine or beer during dinner. "Flashback to the 80’s" is the theme for the whole New Year's Eve countdown party at the Sand Island. The guests will feel the glory of disco era, when neon-colored outfits are legit and everyone is ready to hit the Technicolor dance arena. 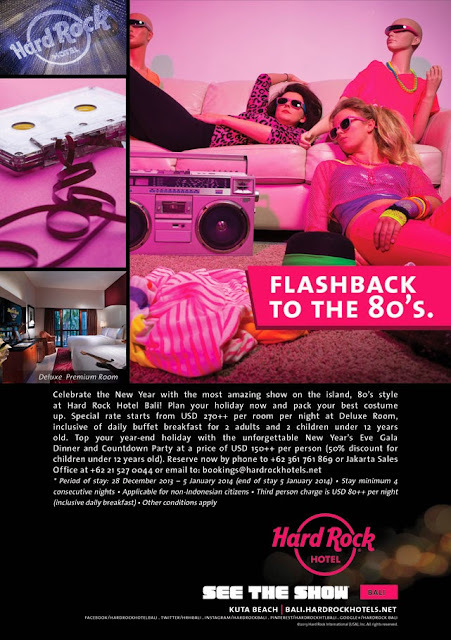 Prepare your best costume and book the “Flashback to The 80’s” New Year package starts from Rp 2.080.000++ per room per night for Deluxe room (room rate is valid for Indonesian citizens and KITAS holders), period of stay is from 28 December 2013 – 5 January 2014 with minimum stay of 4 consecutive nights. Festive season room packages are now on sale at the Hotel’s website, travel agents and via reservation center. To make a room reservation, please call (62) 361 761 869 or email to bookings@hardrockhotels.net. To make dinner reservation, please call(+62) 361 761 869 or email to starzdiner@hardrockhotels.net.